At last crafting emojis have happened. 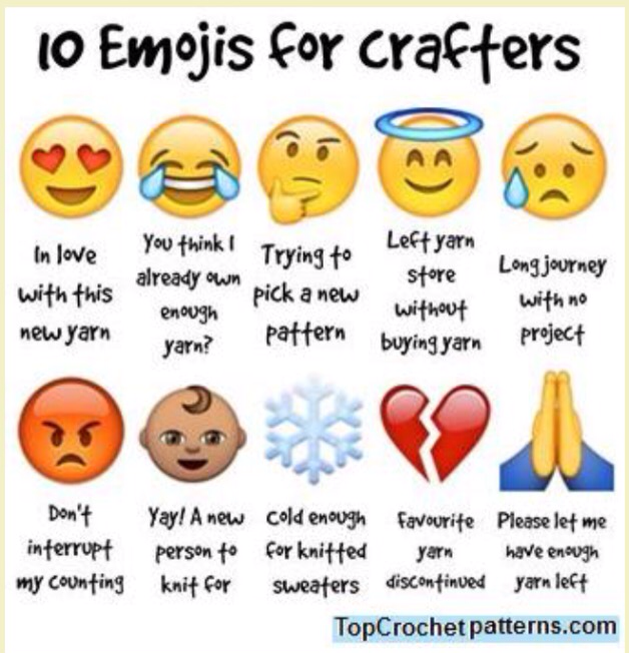 You can buy them in the App Store for around £1.99 and there are emojis for sewing, crochet, knitting, craft themed words and phrases including “shut up I’m counting” . The smiley faces are balls of yarn including a ninja ﻿ball. My crafting friend and I have been messaging them backwards and forwards to each other such is enjoy and the novelty of having these long awaited emojis. My crating friend and I had a sewing day recently. She goes to classes and has no fear of sewing zips etc so has been making beautiful clutch bags and make up brush cases. 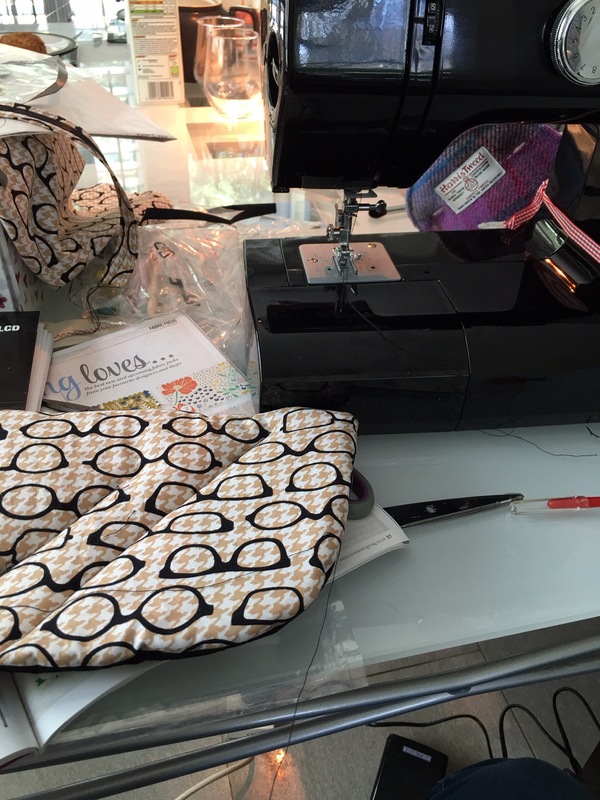 I am a fearful novice and spotted a pattern for a sun glasses case in a recent sewing magazine. 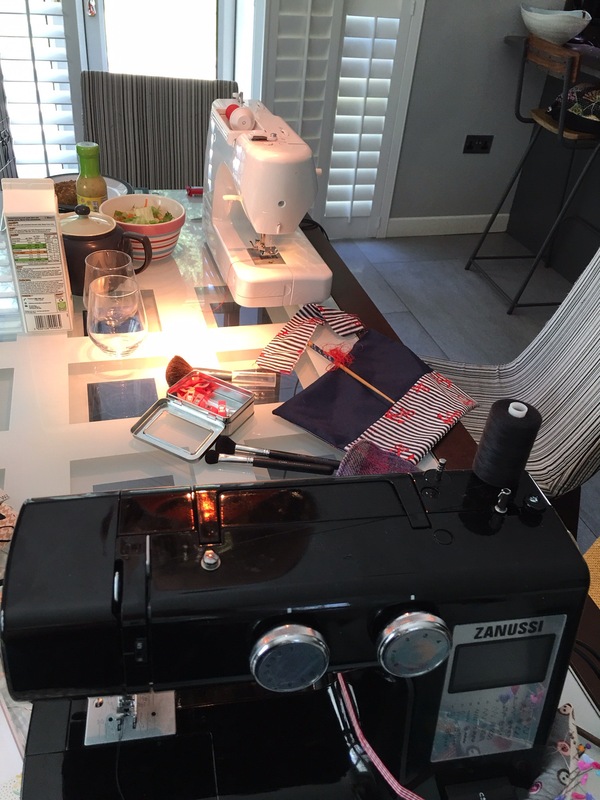 I brought Naughty Lucas my dog up for a play date with her doggy companions and we got the sewing machines out. I love my funky glasses fabric unfortunately I cut it the wrong way round but never mind, it still looks good and works well for me. I really must sit down and learn how to do zips though as this is holding me back. We’ve had the most amazing weather here the past few weeks so the sun glasses have been ON. Hooray! he big theme in crafting these days seems to be Pom poms so I used mini Pom poms as trim. I ordered these on Etsy not realising they were quite so mini. In fact they are microscopic! 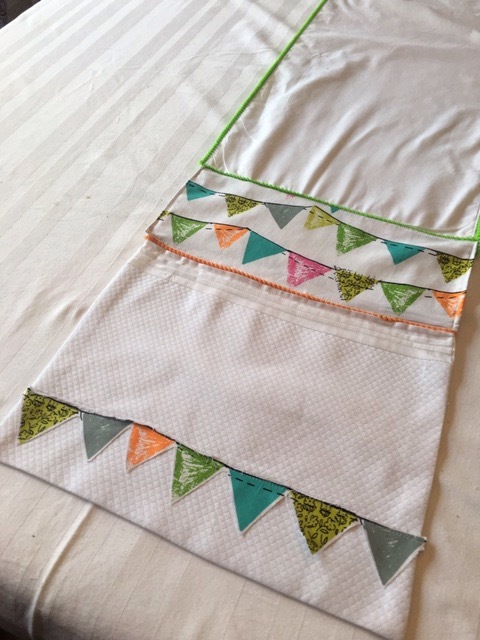 It’s been a while since I sewed so I made a few errors but it sits well on the table and we are approaching birthday season in our house again so this year I’m ready! While away I had a trip to my favourite wool shop The Wool Shop in Newcastle County Down run by the very lovely and helpful Margaret. More about this in anoth blog post.Anyway Margaret had just taken delivery of the delicious new Juniper Moon Farm Finley Dappled lace weight yarn. So many gorgeous colours to choose from but the moment I saw the Aurora blend of autumn shades I knew that this would make into something lovely for my friend. This is expensive yarn but when you think it is 50% merino and 50% silk and each ball is a whopping 798 yards it is worth it. It was lovely to work with too. 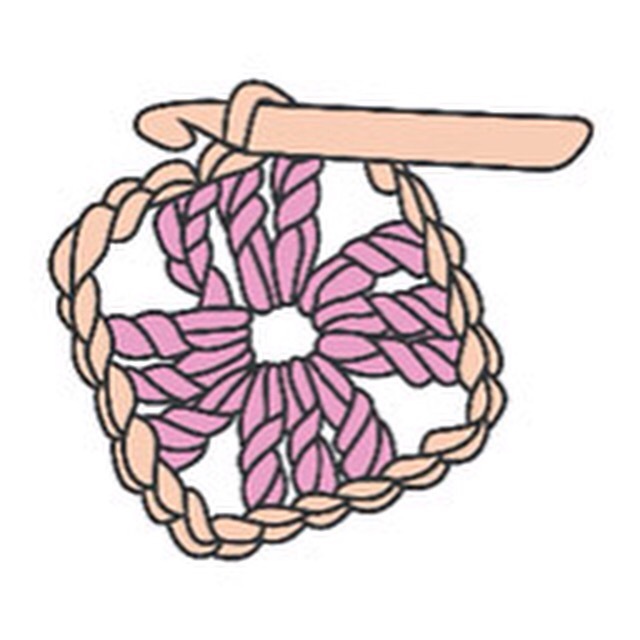 I made up my own pattern, using a 2.5mm hook and learnt to make a picot edging. 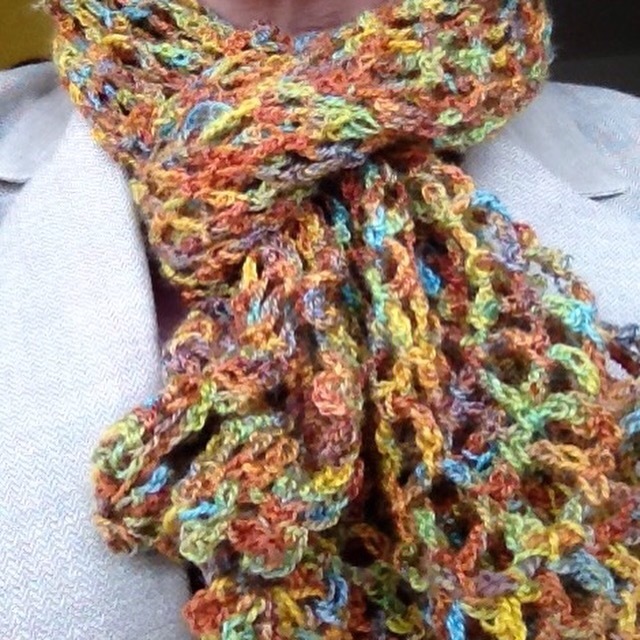 This is a summer weight scarf, and she loved it! 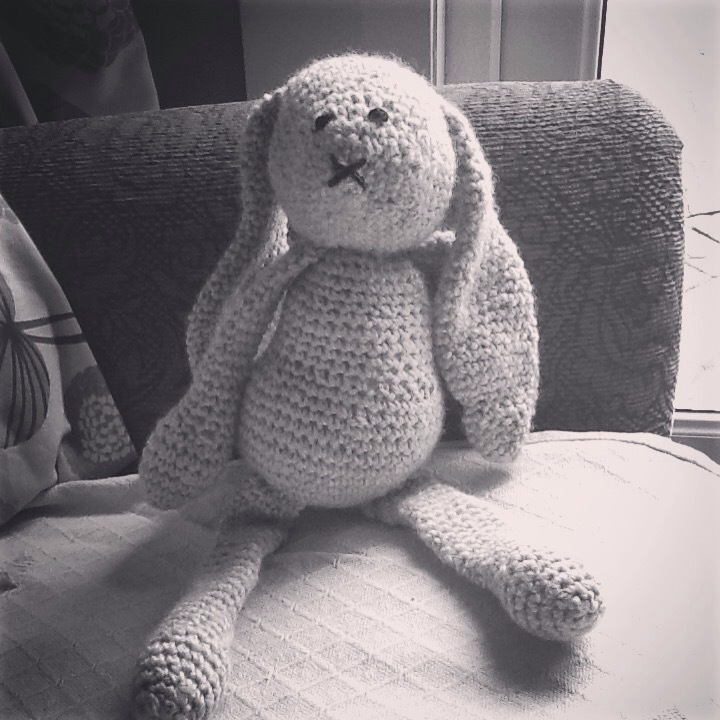 At last I’ve finally made a lovely bunny from this super book of crochet animals. 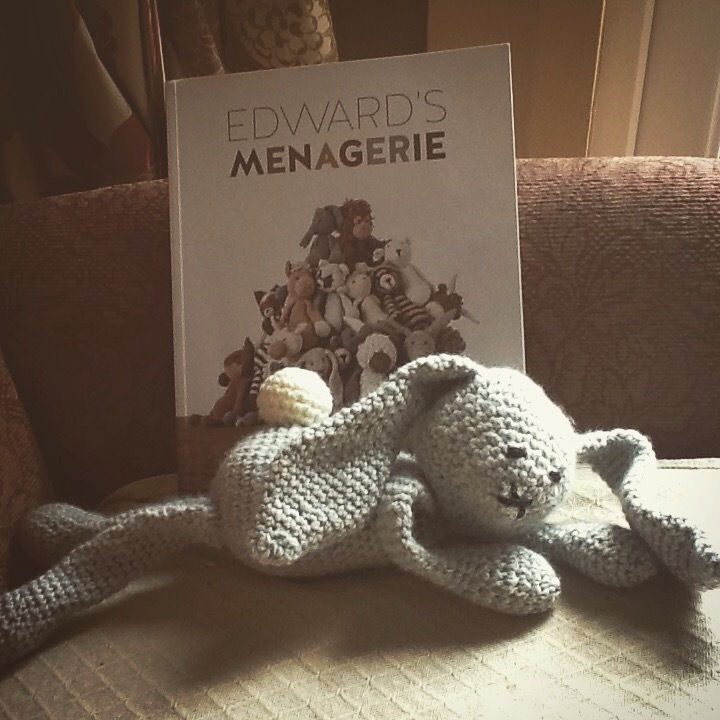 Edward’s Menagerie is written by Lucy Toft and her designs are of cute long limbed animals ideally to be stitched from alpaca yarn from the Toft farm itself. I bought this book very shortly after learning to crochet and realised this was not for beginners. Thankfully now I have mastered the magic circle and made a few amigurumi toys I felt confident to being out the alpaca a wool I bought last September and this bunny is the result. I’m not entirely satisfied. The legs and ears are a little twisted. Should I block them? And such a sad face. This bunny needs either a tutu or a bow tie. I can’t decide if it is a boy or girl bunny either. I had sewn a different nose but my children preferred this X nose. Since I made this bunny over Easter I have made a black and white cat, an elephant and another bunny. I’m also in the middle of a pink and orange cat in much finer yarn which is turning out very very tiny and fiddly. Photos of all my new arrivals will follow soon. Alpaca wool is very lovely and soft to work with. I used a 3.5 mm hook. What even is amigurumi? A type of fish? A dance craze? A skin disease? Amigurumi is the Japanese art of making a crocheted or knitted soft toy, a cute animal or anthropomorphic creature. Kollabora website gives a good clear explanation and some patterns that will make you squeal if you like teeny tiny wee small crocheted things. 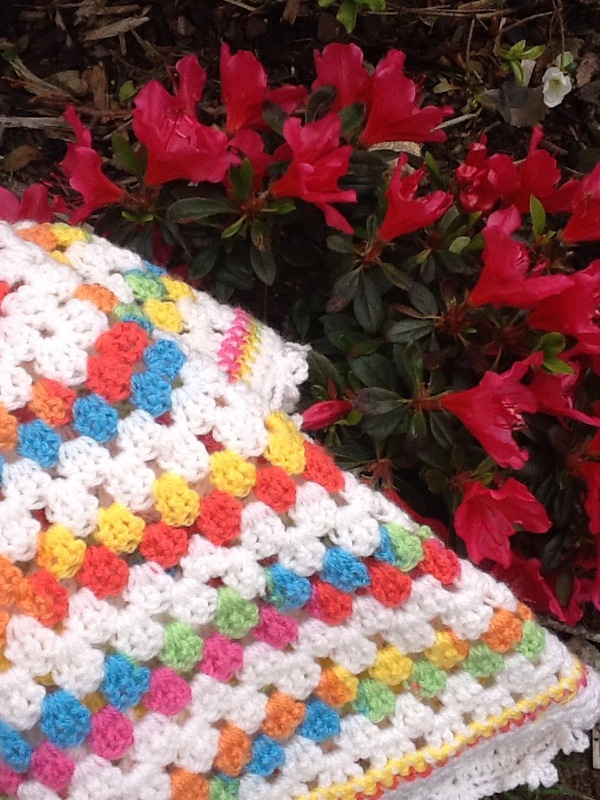 Have a search through Pinterest to see what amazing tiny cute things people have crocheted. In previous posts you can see my first efforts at this dainty craft. Given that I am a hasty, get it done quickly, very loose ill- disciplined crafter , amigurumi toys are very good discipline for me, fine yarn, very fine hook, having to count rows like crazy, tidy accurate sewing together of tiny pieces. Can you guess though I’m totally loving it! Joining the magic circle doesn’t mean that I have filled the vacancy sadly left by the passing of Paul Daniels. No, I’ve finally learnt how to begin crochet using the magic circle method. But it’s so easy I hear you cry. Not for me. But thanks to a link on Pinterest I finally have it sussed and can get cracking on some cute amigurumi projects I’ve pinned over the years. 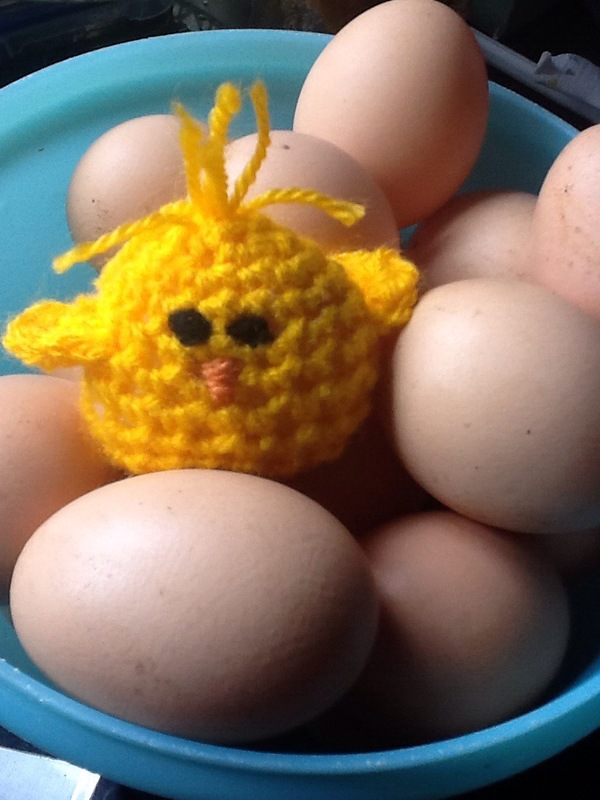 This was super quick to make, and haven’t my hens been laying well! 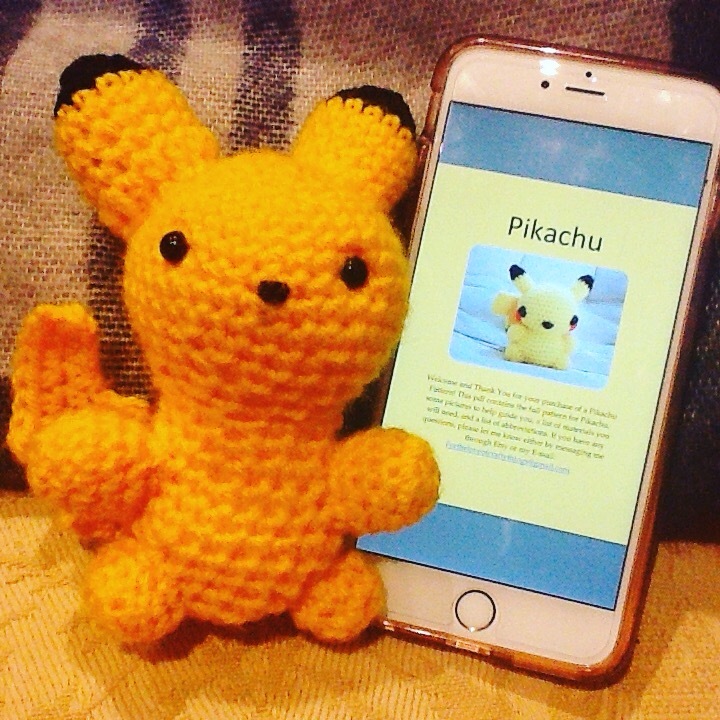 Then as an Easter surprise for one of my sons I made this amigurumi Pokemon, his favourite Pikachu following a pattern I bought on Etsy. Finally I got to bust into my stash of yarn I purchased. (Expensive impulse buy at the Hand Made craft fair) alpaca wool from Toft Farm in England. I bought the book “Edward’s Menagerie” a very long time ago but my lack of being able to use the magic circle technique hindered me from even getting started. But no more! The book divides its animals into three categories , the easiest category begins with Emma the Rabbit. 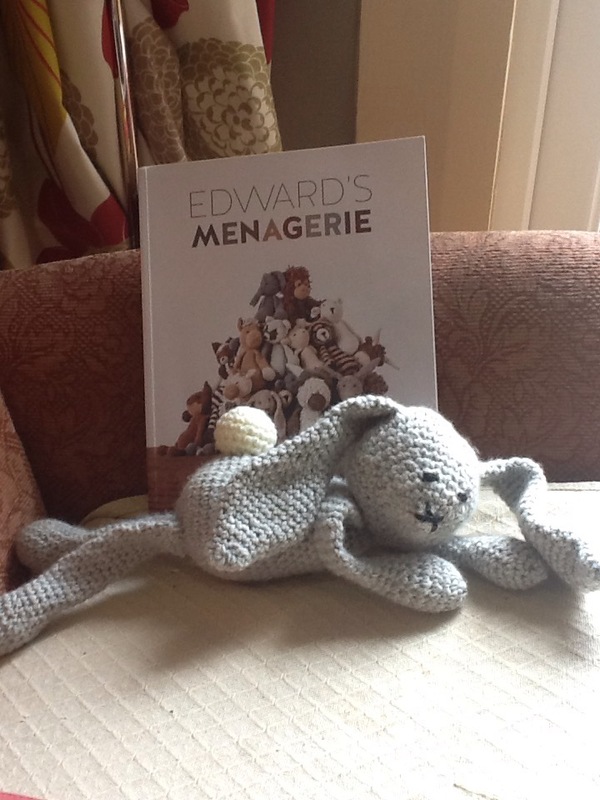 A sweet biography of the animal character begins the fun before the crochet even starts. Most animals are made up of basic body parts with modifications added eg ears and tail for rabbit, fleece for sheep, horns for rhino. I made Emma over two evenings and it was not difficult, just needed to keep counting rows, and as you are working in circle to keep a marker for the beginning to each new row. Sewing all the bits together is straightforward. I’d like to make her a bow tie or neck piece of some kind. Guess I’ll have to go on Pinterest to learn how to do that too. As Paul Daniels might have said “you’re never too old to learn new tricks”. Crochet or magic. New tricks open a whole new world. Thanks to Dr W who sent me this by email yesterday. Emojis always annoy me as there are no craft related icons except for a pair of scissors, ✂️, so this selection will have to do. I’m just finishing off a knitted wrap which I do not like at all. 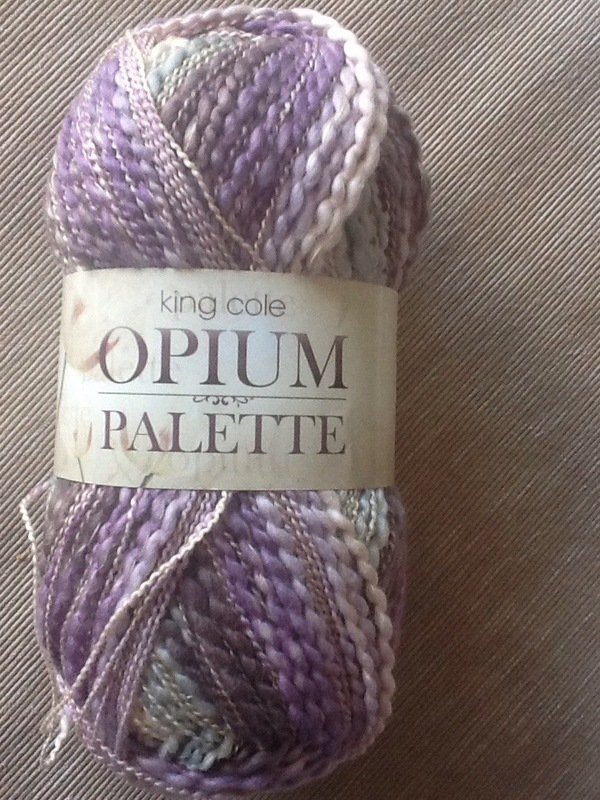 The yarn is King Cole Opium Palette in Lilac wine shades. 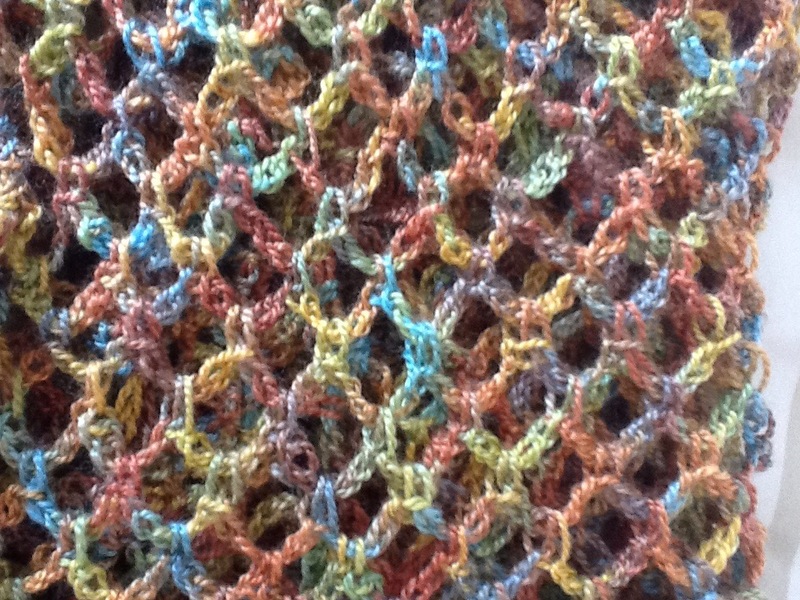 It’s 54%cotton, summer weight, and available in lots of lovely shades. When you see it in a ball it looks wonderful and random. 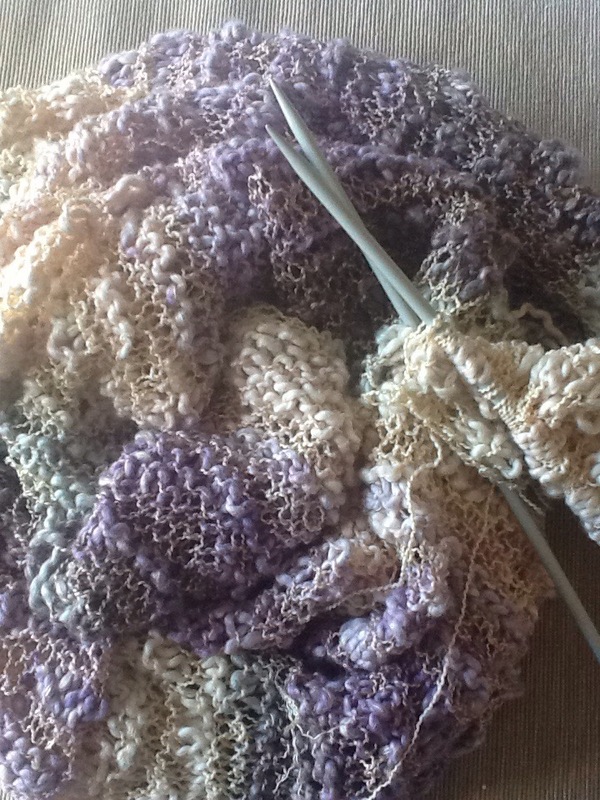 Lots of interesting changes of colour and texture, I had thought it would knit up equally randomly but instead there are clear bands of colours, cream ,lilac, purple, sky blue, brownish purple, it’s a bit too regular looking. I know I’m lazy doing garter stitch but the quicker this is off my needles the better. 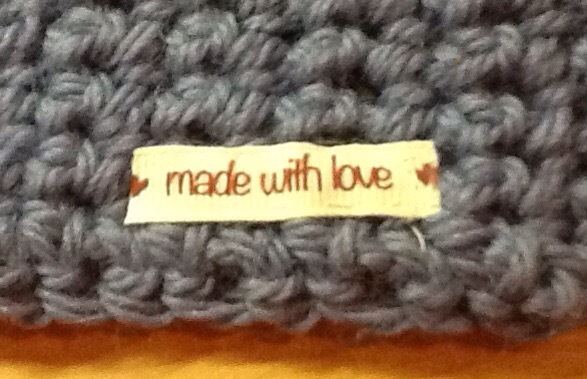 I don’t think the yarn would be improved by a fancy stitch. 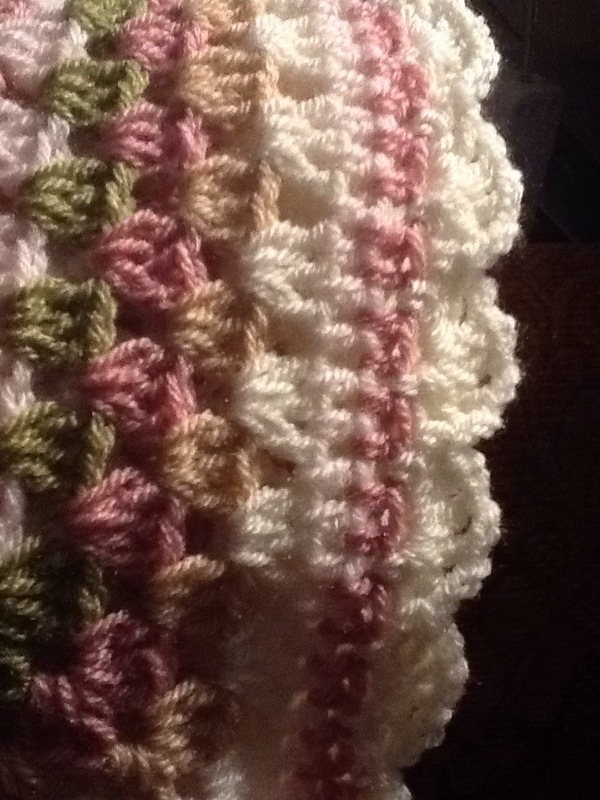 I’m almost finished the length of it, then the plan is to crochet an edging and make some long tassels. 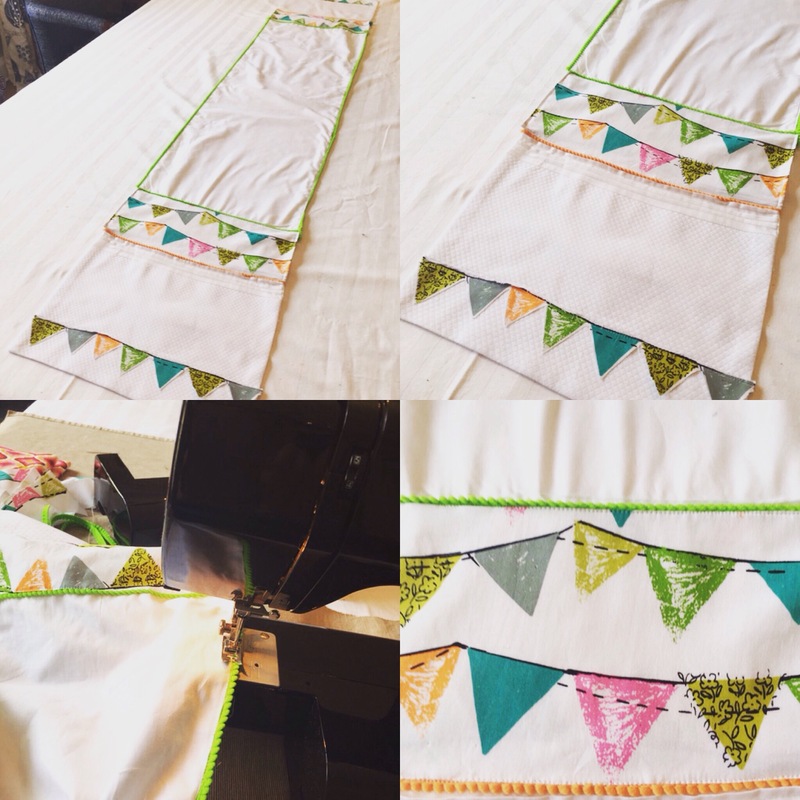 I’ll have to do a search on Pinterest to work best way to make tassels. I love to wear purple in the summer, hopefully a plain dress or tee will bring this to life and I can enjoy it a bit better. I can’t wait to get it finished and away so I can start in some amigurumi patterns I bought on Etsy this week. Last weekend I discovered the most fabulous well stocked yarn store, The Wool Shop, in Newcastle Conty Down. There was a great range of all colours, manufactures, styles and price range. There are sofas at the back of the shop – a crèche for men who venture across the threshold. It was all very tempting! 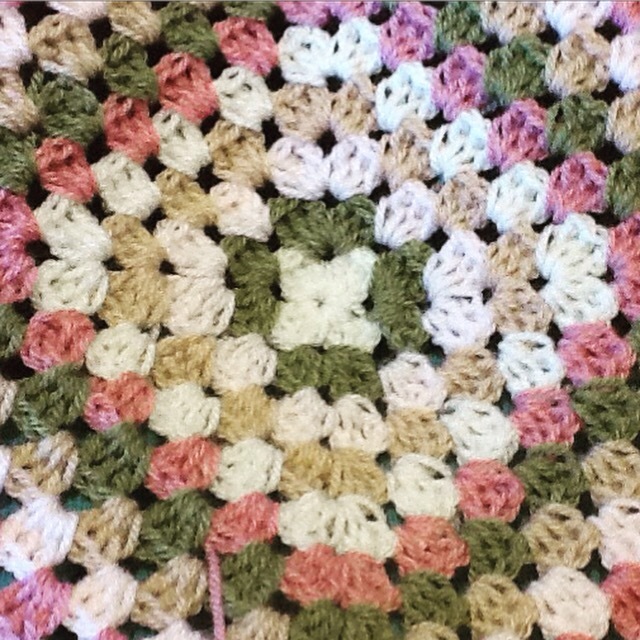 Having just gifted a pink and white granny square baby blanket to a sweet New Year baby, some Stylecraft Special DK yarn in cream, pale rose, meadow, soft peach and stone found its way into my shopping bag. 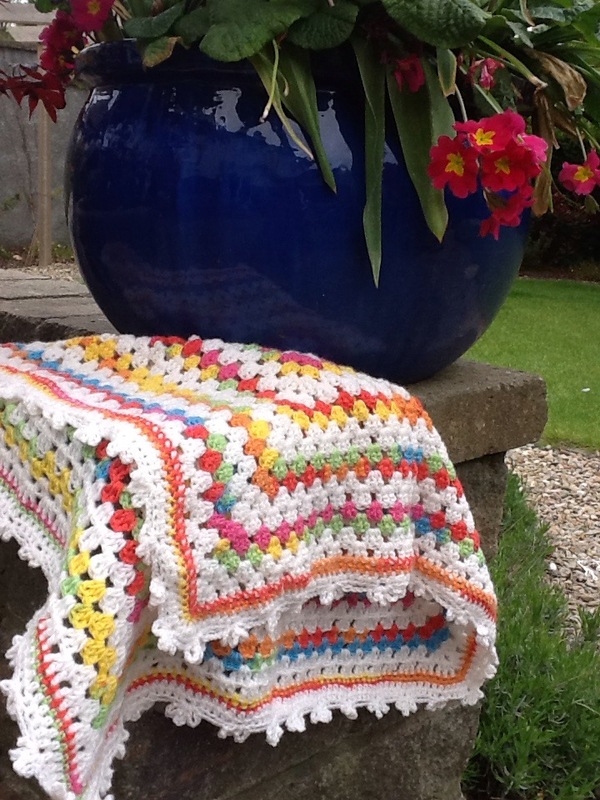 So a week on I am very pleased with the finished blanket in granny square pattern. The soft colours are warm and give an antique feel and will be very pretty for the next baby girl to be born amongst my family and acquaintances. I invented my own edging, I’m calling it “Open Shell”. 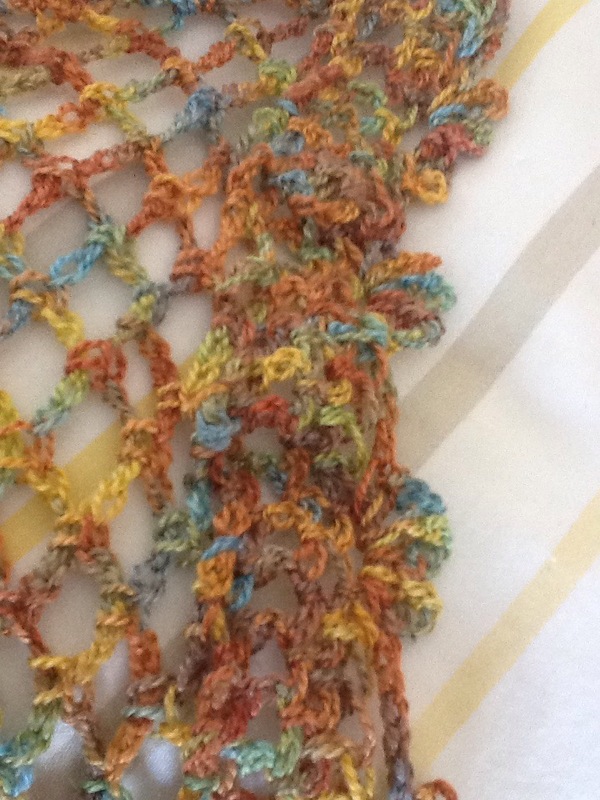 I crocheted two chains followed by a double crochet around the blanket, then the second row was a (treble, two chains)x4 into a 2ch space, followed by a double into the next ch space, following this pattern all around the blanket. I’m so pleased with this, the finished effect is a gentle airy scallop.